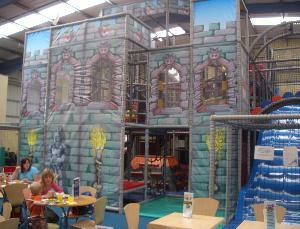 Ruff ‘N’ Tumble Adventure World is the North-East’s finest indoor play centre. Located in Newton Aycliffe, close to junction 59 of the A1(M), we are ideally placed to meet your children’s play and party needs in County Durham. Both children and parents are offered a friendly welcome to our new purpose built indoor play centre. It is ideally suited for kids under 12, with dedicated areas for the under 5’s. Ruff ‘N’ Tumble has all the latest equipment including Bungee Trampolines, Climbing Wall, Ten Pin Bowling, Sports Courts, Drop Slides and Ball Cannons. Parent can relax and enjoy excellent food whilst the children wear themselves out in a fun and healthy atmosphere. Ruff ‘N’ Tumble has the largest parent and toddler facilities in the region – segregated for under 5s. Toddlers have their very own dedicated Village, providing a two-lane rainbow slide and mini slide, activity boards, a ball juggler and a fun packed ‘Little Tykes’ ride-on area. We have supervised toddler groups including painting, stories and other fun activities. Our Parent and Toddler Mornings are a great opportunity for parents and guardians with children under 5 to meet friends, make new ones whilst the toddlers have fun!